Please append ".tut.ac.jp" to the end of the address above. We address the issues related to auditory perception and cognition using various psychological experiment paradigms, mainly psychophysical methods. Our research scope covers various themes from computational modeling of the early stage of hearing to cognition of music. We aim to reveal the full function of hearing by approaching from both low-level processing and that of higher function. In the auditory system, there still remains some unexplained functions; the auditory path from the outer-ear to the auditory area of cerebral cortex is too deep inside to observe from the outside and the path is complicated due to lots of nuclei relays. 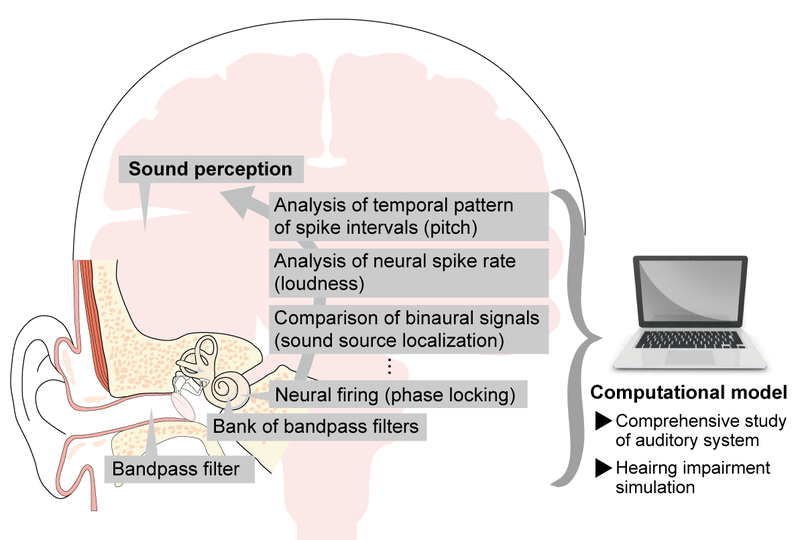 To understand such hearing has been recently facilitated by computational models that express the processing at each stage of hearing by signal processing. We measure the fundamental functions of hearing such as encoding frequency components, period of waveform, and dynamic range of sounds by psychophysical experimental methods, and reflect the results in a computational model called dynamic compressive gammachirp filterbank model which has been developed in collaborative research projects. By following the prediction of perceptual phenomena by the computational model and its experimental validation, we contribute to the understanding of the human auditory system. 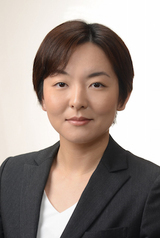 Japan is experiencing a "super-aging" society nowadays. It is predicted that age-related hearing loss will increase with the increase in the population of elderly people. Although it is necessary to avoid disconnection of communication due to hearing loss, it is so hard to imagine how hearing loss changes the perception of sound. The computational model of the auditory system can output not only an expression of auditory function, but also sounds deteriorated by modules causing hearing loss. It allows users "to listen as a person with hearing loss". We are planning to apply this hearing impairment simulation to an educational course for speech therapists, and disperse broadly to the general public to learn about hearing. This simulation will also allow us to evaluate sounds with specific hearing loss, and obtain cues to synthesize clear sounds for all of us. The questions of how we perceive music as an object with recognizable temporal structure, receive various emotions from it, and enjoy it are still research themes stimulating many researchers. We will study how music changes human audio-visual information processing with the cooperation of professional musicians intensely trained since childhood. We are also investigating the diversity of musicians who have often been treated as a single group.